I’ve been pondering whether to request that the town make a few small one-way streets two-way for bikes. These are cases where the traffic rules that were developed for motor vehicles don’t address the needs of people on bicycles. Over the years that I’ve observed people riding around town, there are two short streets that warrant some attention. Narrow, one-way Freeman Street in Provincetown is often used as a cut-through by people on bikes to avoid congestion and get from Standish Street to Commercial Street. This short (370 feet, or 0.07 miles), curving street is frequently used as a shortcut to avoid the heavy congestion of buses, trucks, and motor vehicles at the intersection of Standish and Commercial Street. That intersection is a bottleneck for vehicles heading to MacMillan Pier, the pier parking lot, and the bus station. Like all of the one-way streets in town, it’s very narrow (between 14-19 feet) with no sidewalks and, in this case, no on-street parking. The street is signed (twice) with a 5 MPH speed limit. The street continues as a paved Town Landing between the Squealing Pig restaurant and Land’s End Hardware all the way to the beach, where you’ll find the Provincetown Aquasports kayak rental shop on the beach at 331R Commercial Street. Gosnold Street in Provincetown on Google Streetview (the oddly blurred-out house is 6 Gosnold Street). Gosnold is signed as one-way for motor vechicles heading toward the viewer. The second street where you’ll see a lot of folks riding against the one-way signs is Gosnold Street, an even shorter (200-foot) connector street than Freeman. When heading west on Bradford Street, it’s the last street to return to Commercial Street from Bradford Street before the steep hill that heads up to Prince Street and the Grace Hall parking lot. Gosnold is commonly used by people on bikes to avoid the congestion in front of Town Hall when heading west. 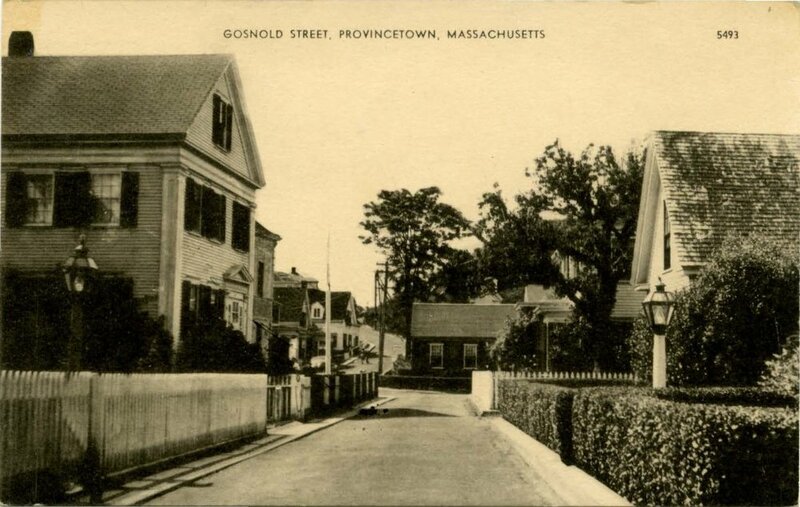 Provincetown History Project, Ada Gilmore Collection, Gosnold Street postcard circa 1930. 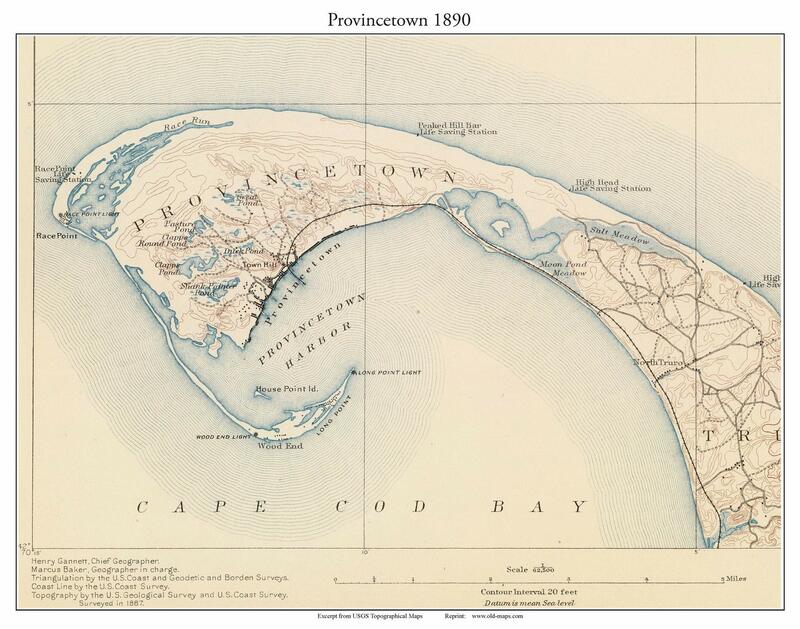 The Year-Rounder’s Guide to Provincetown, End of an Era for Adam’s Pharmacy, May 21, 2015. Gosnold Street photo circa 1880. Federal and state design guidance for these kinds of streets is sparse, with the Federal Highway Administration’s shared street accessibility guidelines focusing on providing separate spaces on much wider streets than little Freeman. Highway guidelines don’t really work on 300-year-old streets. Cambridge, MA’s Shared Streets program shows some rather elaborate conversions of narrow streets to shared spaces. Provincetown has some special legislation that allows the Select Board to set its own rules for bicycles on Commercial Street, and I’d like to see that extended to the rest of the streets in town. Since the town essentially sets the rules for Commercial Street, it doesn’t follow standard street design, striping, or signage requirements that you see elsewhere. The sidewalks are extremely narrow (barely accommodating a wheelchair), there are no bike lanes or pavement markings to indicate two-way bike traffic, and seasonal parking restrictions are used to make it able to accommodate summer crowds of people walking and biking. The balancing act of how we regulate Commercial Street is entirely local, as it should be. Other towns have painted in “contraflow” bike lanes on some streets, along with signage to indicate that bikes are allowed to ride in both directions. But those streets tend to be urban, with sidewalks and wide travel lanes that can be shrunk to accommodate a bike-only lane. It’s conceivable that a contraflow bike lane could be painted, but that actually seems like overkill. Is separation like that really necessary on streets with a speed limit of 5 MPH? But the fundamental structure of the streets haven’t changed. Freeman appears a bit wider than in the postcards since the picket fences are no longer there, and more driveways and parking areas line the sides of the way (which is likely why the fencing is gone). It seems like an over-reach to actually change a street like this. The pragmatic New Englander in me says just leave it as it is. There’s no need for fancy pavement or painted pavement markings that need to be reapplied every year. Some drainage improvements might be nice, but otherwise these streets function fine as they are. Let’s just change the rules to match the current (and historical, pre-motor vehicle) use and be done with it. Oral history states that Freeman Street was once called Vine Street (we still have West Vine Street in the West End), and it snaked from the harbor to the top of High Pole Hill where the Pilgrim Monument stands (most likely via modern-day Standish/Bradford/Winslow streets). I have yet to find a map to verify this, but when you look at Google Maps, you can see that the winding curve of Vine Street is still somewhat apparent in the layout of the roads. The closest match to this configuration appears on an 1880 USGS map, but the streets names are not noted. 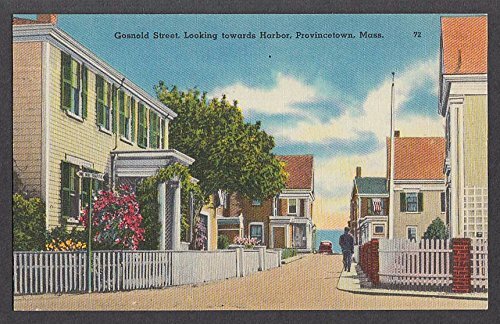 These two streets are among the most photographed in town, and their picturesque 19th century appearances are recorded in a number of postcards. You can often find them for sale on eBay or through a Google search. Gosnold Street, Provincetown, MA. Photo circa 1880. 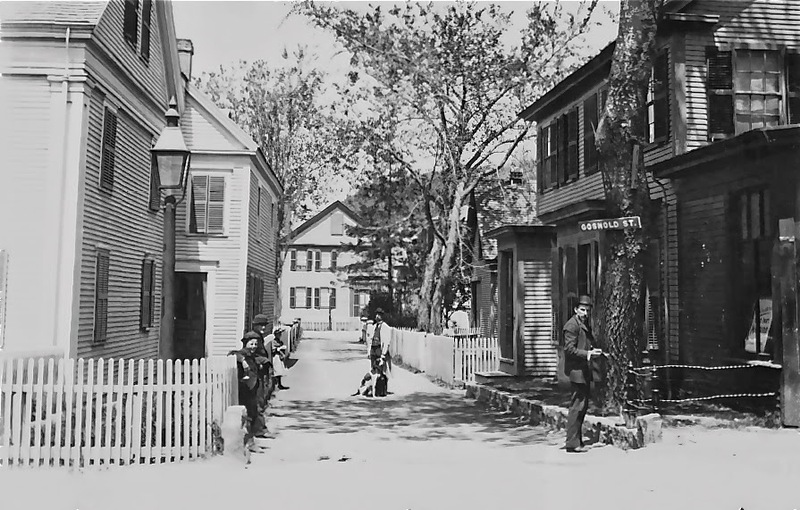 Freeman Street, Provincetown with the Pilgrim Monument in the background. Postcard circa 1900. Freeman Street, Provincetown. Postcard circa 1910. Gosnold Street, Provincetown. Google Streetview, October 2015. Gosnold Street, Provincetown, MA. Postcard circa 1920. Gosnold Street, Provincetown, MA. Postcard circa 1930.